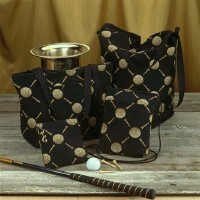 Matching black and khaki tapestries with old-time lady and gent golfers in a blend of cool neutrals. Choose from three styles specially sized for small essentials and on-course carrying. Perfectly sized for tees, balls and small accessories. Also with moistureproof lining. (Size: 5-1/2" w x 7" h). The perfect on-course accessory. 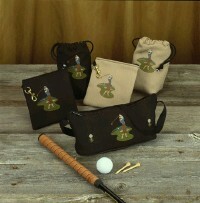 Clips to golf bag - great for tees, balls and personals. Top zip with moistureproof lining. Stylishly fun with a short strap that can be flung over the shoulder, or just be a simple handle. Top zip with moistureproof lining. Smart and sylish. Zip top with shoulder strap and two innder pockets. Also with moistureproof lining. Essential for everyday errands and toting around town. A versatile bag for virtually everything. Zip top with dual shoulder straps, front pocket and six inner pockets. Also with moistureproof lining. When you want to bring just a little, with a lot of style. Zip top with long shoulder cord, front pocket and two inner pockets. Also with moistureproof lining. 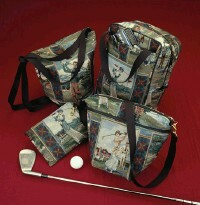 Argyle-accented tapestry with swinging snapshots of lady and gent golfers in classic golf attire. Choose from four versatile styles featuring a rich blend of traditional golf colors. Smart and stylish. Zip top with double shoulder straps and two inner pockets. Also with moistureproof lining. Generous enough for two pair of shoes. With wrap-around, dual-zip closure and large front and back pockets. Also with double handles, side tab accents and moistureproof lining. The perfect on-course accessory. With top zip and corner clip for convenient golf bag attachment. Unique shape with super styling. Zip top with swivel clip shoulder strap and fron zip pocket. Also with two inner pockets and moistureproof lining.